The Deer Mountain Residence at One Steamboat Place offers the best of everything. With stunning views up the ski slope as the sun sets, you have a front row with a prime view of the slopes, Gondola Plaza and the Kids ski school right from your family room, balcony or bedroom. Walk into the Deer Mountain Residence and you will be immediately drawn to the incredible view of everything Steamboat Mountain has to offer. The spacious open floor plan with living, dining and kitchen areas all connected provides the perfect gathering place for families and friends. State-of-the-art A/V equipment including a Bose system, 55in 3D HDTV complete with surround bar in the living area and 42in LED in the master provides for superlative entertainment. The kitchen is a chef's delight; professionally equipped with Viking appliances. For the grill master, the balcony is equipped with a Viking grill. The residence is designed for entertaining with a dining table that comfortably seats 10 along with 3 additional seats at the kitchen island. There are four bedrooms, all with private bathroom, in this slopeside residence. The wonderful master suite includes a fireplace along with a second master on the other side of the floorplan. In between the third bedroom offers a queen bed and the fourth offers two double beds. The home office provides the perfect area for staying in touch with an iMac computer and high speed internet connection. A printer is available at the front desk, and guests can also videoconference with the front desk from the home office. 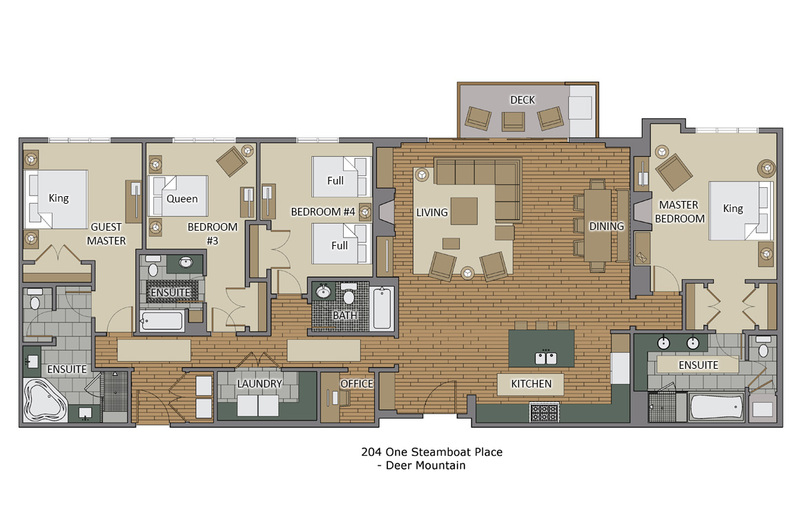 For the smaller family or group, Deer Mountain can be configured to offer 2 or 3 bedrooms by locking off bedrooms not needed. Special pricing is available for these options by contacting our reservations team. Click details to see total. Reserve Early for Winter 19 - 20 and SAVE for Winter! Reserve by May 15th and take advantage of our specials.